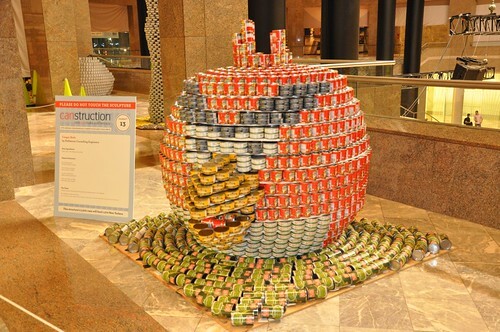 SO here’s what you guys have been waiting for (and finally found it on other internet sites and blogs): Completed Canstruction Entries for this year: My FAVES! 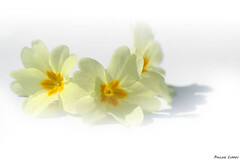 The awards get announced Nov 14th so watch this space for an updated. 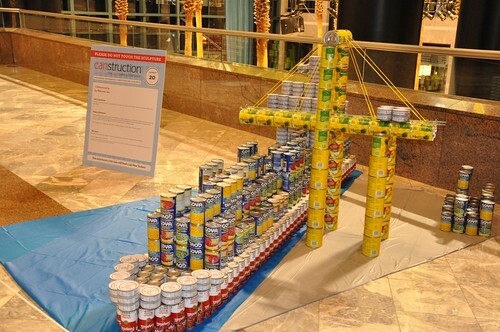 Here’s the “official” pic, courtesy Canstruction/Kevin Wick. 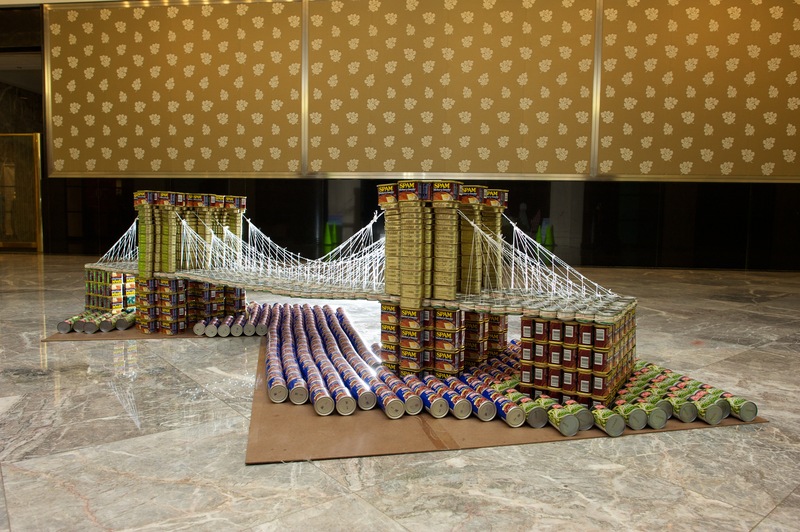 I’m also rooting for an HONORABLE MENTION for “Alexander McCan” by KPF Architects. These guys won the GOYA sponsorship for their idea. 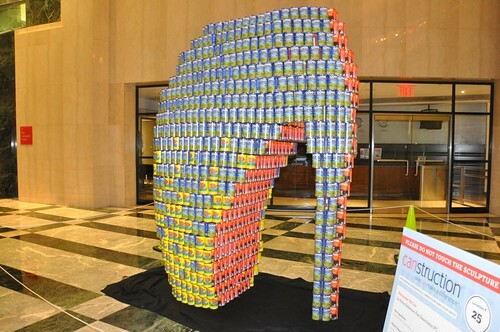 But the manner in which they constructed this giant shoe is incredible. They used a 3 can matrix, lined them up on plans and taped them together. They use minimal supporting/layering elements AND managed to get a pattern on the front of their ginormous rendition of Alexander McQueen shoe. Again SKANSKA’s bridge simply because the it is awesome. However I have a couple of other faves in close succession. The “Loaded Dice” by Gensler and WSP Flack & Kurtz. Why? Because it is a cube so perfectly made! 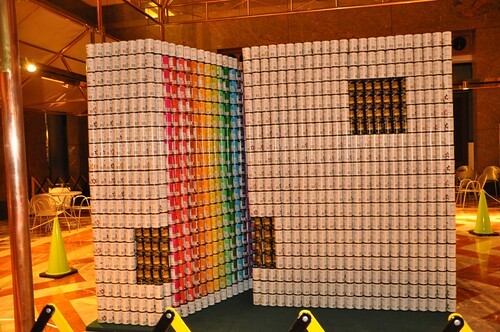 The slice out of the cube, represents the near perfect use of color from the labels. (At one level it reminds me of this cake by Darla, one of my favorite bakers) Of course the Gensler+WSP team is gunning for everything but I think they are a shoo-in for BEST MEAL but also might get BEST Of SHOW. Also, if there was an award for Best-Music-Played-While-Building-Can-Sculpture and Most-co-ordinated-team, they would have gotten that one as well. 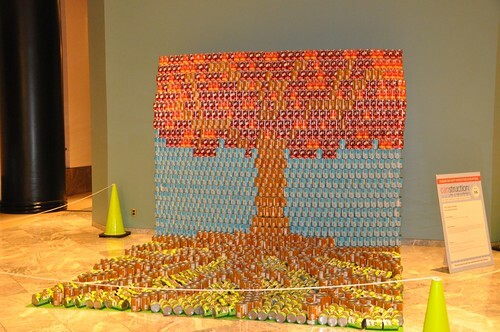 The “official” pic, courtesy Canstruction/Kevin Wick. 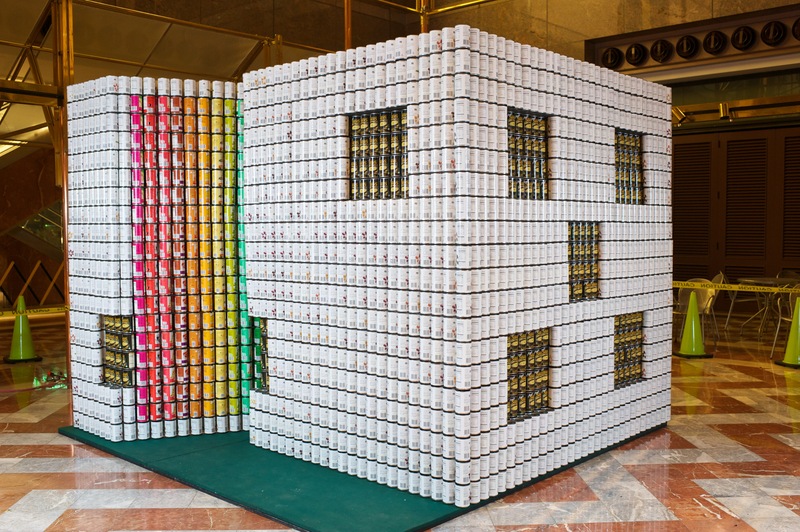 The “Root Against Hunger” by Dattner Architects. 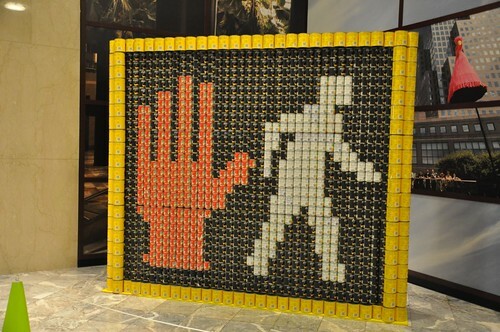 Simply because it is a really great way of getting a 3D quality to your Can-sculpture and using putting labels to real good use. And their T-shirts matched their idea for their sculpture. I think they may get BEST USE of LABELS. I would have to say that this one is a tie between Skanska’s Bridge and Gensler+WSP’s Cube. 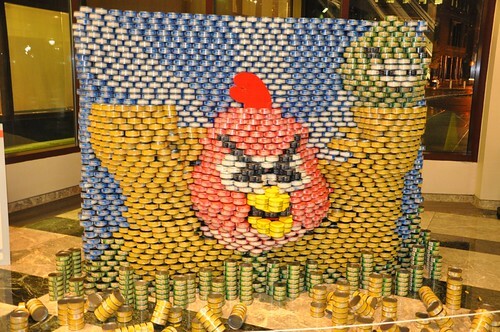 Actually titled “Hungry Birds”, Ennead Architects target are inspired by this populist icon of present day gaming. They wanted to build something that would appeal to adults and kids alike. I’d say they’re bang on the can! But the jury is still out on whether DeSimone Architects did a better job than Ennead. 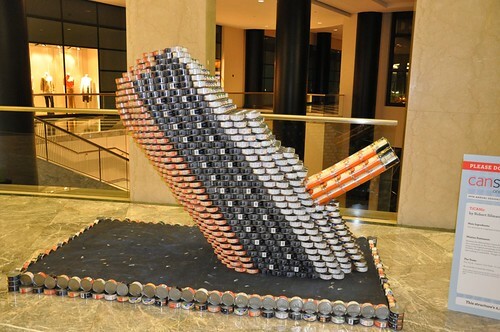 “Can-tanership” by Halcrow. 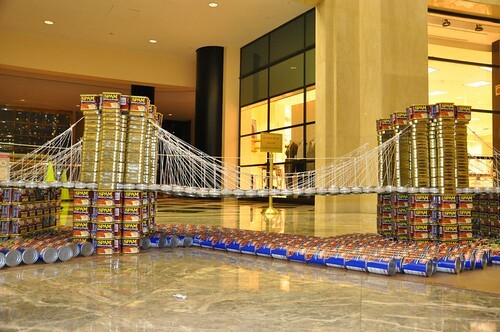 These guys have been wanting to participate in Canstruction for many years now. Finally here, their idea is simple, elegant and reflective of what their company’s strengths are. 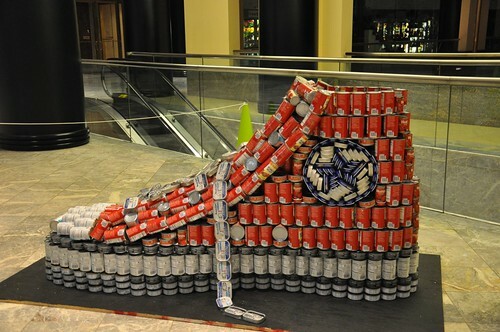 The Converse Shoe. Loving the lace.